Take one look at the early 2018 PFF rankings and you’ll find only a few differences at which player each of our analysts have atop the various spots. There are a handful of favorites to be the top producer at their respective position, but there are some longshots too. We have already covered some candidates at quarterback, running back, and wide receiver. Now we’ll finish up the series by discussing the tight ends that should be in the conversation. If he stays healthy, Gronkowski is a near-lock to lead the position in fantasy points. However, staying injury-free has been something that hasn’t come easy for the Patriots’ tight end. He appeared in 16 games in each of his first two pro campaigns but has failed to do so in the six seasons since. When he is on the field, Gronk has dominated, finishing inside the top-five in fantasy scoring in every season since 2011 where he’s played in at least 11 games. That includes being TE1 three times in PPR formats and four times in standard leagues during that span. He comes with a steep price considering the risk, but those that land Gronkowski will enjoy his production when he’s in the lineup. Kelce was the top-scoring PPR tight end in each of the past two seasons and has placed in the top eight in fantasy points at the position in every year as a pro. In 2017, the Chief set career highs in targets (117) and touchdowns (8) while finishing atop the position in receptions (83) and second in receiving yards (1,038). Patrick Mahomes is taking over at quarterback and Sammy Watkins was added to the mix at wide receiver and both changes are things to consider when assessing Kelce’s potential value. 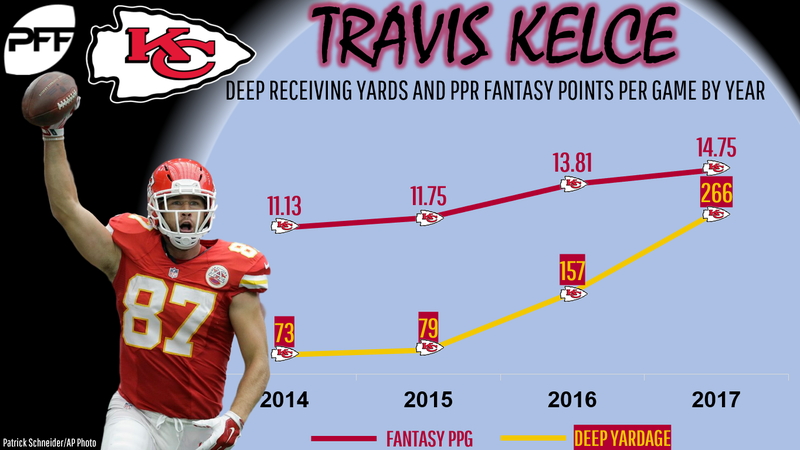 He could see a slight dip in targets and some touchdown regression, but Kelce’s ability to create plays on his own make him a safe bet to finish in Tier 1 while offering a very high ceiling. For the first time during his five-year NFL career, Ertz finished inside the top five in 2017, at third at the position. The numbers he had last year were nearly identical to his previous two seasons except for touchdowns. He scored a career-high eight times last year after scoring just four times in 2016 and twice the season before that. Over his past three campaigns Ertz has averaged 103 targets, 75.7 receptions, and 831 receiving yards. After years of teasing fantasy owners with his potential, things finally came together for the 27-year-old. With the Eagles’ offense flying high for the foreseeable future, Ertz will remain a highly coveted fantasy asset. After the Giants were decimated by injuries at wide receiver, Engram became a focal point for Eli Manning. His 108 targets, 64 receptions, and 722 receiving yards were the most by a rookie tight end during the PFF era. With Odell Beckham Jr. and Sterling Shepard back in the lineup and the arrival of Saquon Barkley to the team, Engram’s role and targets are certain to decrease. Still, he should be more efficient with his opportunities than his 6.3 yards per target mark in 2017. He is a strong starting fantasy option heading into his second season and currently sits as the consensus No. 4 tight end in the early PFF consensus rankings. Olsen didn’t miss a game for nine straight years but played in just seven games in 2017 and even in some of those outings he was far from 100 percent. The veteran finished with only 17 catches on 34 targets for 191 yards and one touchdown. After some speculation that he might retire, the 33-year-old is back in the fold for the Panthers for 2018. Before last year, Olsen finished inside the top five at the position in PPR three straight seasons. His lack of scoring makes it tough to envision him finishing as TE1 though. The veteran has eclipsed the six-touchdown mark just twice in 11 pro seasons. Of these tight ends currently outside the top 3 in the @PFF_Fantasy consensus rankings (PPR) which one has the best chance to finish as fantasy football’s top scoring TE in 2018? The arrival of Kirk Cousins is expected to give the entire Vikings offense a boost and Rudolph is no exception. The quarterback played in some tight end-friendly systems during his time with the Redskins and has a knack for targeting the position. Of the 99 passing touchdowns Cousins amassed in Washington 27 of them had a tight end as the recipient. Rudolph has made 15 trips to the end zone over the last two years. Minnesota has one of the most explosive offenses in the NFL entering 2018 and Rudolph will remain one of the team’s best red-zone options in the passing game. He’s projects a bit better in standard formats but offers top-five potential. After being signed by the Packers in free agency, the hype is building for Graham. The veteran currently has a 6.04 consensus season-long ADP (TE6), which seems a bit high based off his declining skill set. The 31-year-old’s three-year stint in Seattle was mostly disappointing. He hasn’t finished as TE1 since 2013, but he has been top-four twice in the last four years. Davante Adams is the top choice, but after that targets are up for grabs in the Packers’ passing attack. Graham needs to improve greatly on his 5.7 yards per target from a year ago though before even considering him as a potential option. He was too TD-dependent last year and getting 10 scores again seems unlikely. Reed finished last season as fantasy’s TE43, playing in just six contests. He caught 27 of 33 targets for 211 yards and three touchdowns. Aside from his breakout campaign in 2015 the tight end has mostly proven unreliable, missing 28 games over five years. He scored 11 times in 2015 but has just 11 total touchdowns throughout his other four seasons. The injuries aren’t the only concerns with Reed for fantasy purposes heading into 2018. The Redskins have a ton of changes in store on offense, headlined by Alex Smith taking over at quarterback. It’s hard to imagine him breaking his injury trend, but at the right price Reed could be worth a gamble.